Welcome to Section 43 (Central and Southern Texas) of Alpha Phi Omega, a National Service Fraternity. Alpha Phi Omega is the national, co-educational, service fraternity that sets the standard for campus-based volunteerism. Since 1925, Alpha Phi Omega has made a positive difference in the lives of college women and men and has helped to improve the quality of life for individuals in need. Nearly 300,000 students have been initiated into Alpha Phi Omega since our founding and our current Membership exceeds 18,000 students at approximately 350 colleges and universities. 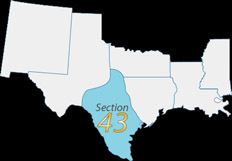 Section 43 consists of Alpha Phi Omega chapters at nine Texas colleges and universities. Additionally, the section is a subset of a larger region — Region VII — of APO. The purpose of Section 43 is to bring local Chapters together through Friendship, Leadership, and Service to further the ideals of the Fraternity. Want to find out the latest going on with Section 43?